We started the morning by finishing setting the electrodes to capture the lowest volumes and and did the same test that we did the previous day, where I had to identify how many beeps I heard. After that, I was ready for my first soft sound detection test. We went into the testing booth, similar to the one I wrote about during my CI evaluations. Joanie positioned the chair in the booth so that my CI would align to the speakers and capture the sound better. She then went into the other compartment and motioned to me through the window that she was going to start. All I had to do was let her know whenever I heard a sound. She sent out really soft sounds in all pitches. After the test, we back to her office, where she showed me the test results. I was able to hear some sounds as soft as 10 to 20db. If you look at the graph below, you can see how your level of hearing is measured. The lower you go, the louder the sounds are. And the from left to right, the sounds decrease in pitch. Back in June, my hearing had dropped to the severe-profound levels. I could hear a motorcycle, but only if I was near it. I could hear a piano, but only if my ear was right next to it. 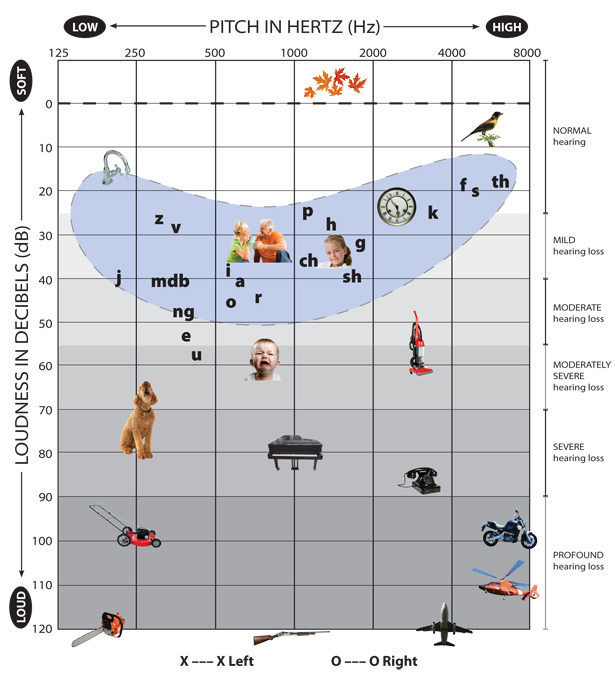 Most people with normal hearing hear things that are in the range of the blue “banana” on the graph. With my CI, I am able to capture the same softness of sounds as people with normal hearing do. catch every single word when people spoke, but they no longer sounded like Minions. Even though it was still early in the process, Joannie decided to test my word recognition, just for fun. So she hid her face, and asked me to repeat what she said. After the first one, I got every single one right. I still couldn’t hear everything clearly, but after I heard the way she said “sun” and “mon” I was able to understand everything else. Then she increased the CI’s volume and threshold. Even though it was initially a bit loud, I noticed that sounds were a bit clearer. Then we did the same test with the months of the year and I got all of them right. Another thing that plays a role in how clearly people hear with CIs is the speed at which the sound is programmed to reach the brain. For those with normal hearing, sound works the same way – it travels through the ear, hits the auditory nerve and goes to the brain. The CI mimics that – the external processor captures sound signals which are transmitted through the electrode arrays through electricity transmission and are sent straight to the auditory nerve. The brain interprets the signals as sound. Some people understand better when the electricity speed is faster; some people perform best at slow transmission rate. So our goal for the next few days was to determine which electricity speed my CI should be programmed at so that I hear clearer. She cloned the program that my CI was already set at, and created a new program, only with a different transmission rate. I had until the next day to try both programs. So my homework for the day was to go into as many different sound environments as possible and try both programs. I brought the remote control everywhere I went, and kept switching back and forth. I really felt like I was a robot. The new program seemed to be better than the initial one, but a lot of the times, it was hard to tell. But I did notice that I could understand when strangers spoke better with the new program. While killing some time outside, some Carnival worker started a conversation with my mom and asked why we were visiting Quebec. My mom explained that it wasn’t really a vacation, and that she was with me because I had to get a CI. “Mais oui je peux parler!” I answered, (Of course I can speak) giving him a “you’re an idiot” look and a fake smile. I think he’s still scratching his head. Note: Not every audiologist experiments with the electricity speed. If you’re currently in the CI programming phase and your audiologist hasn’t brought that up, you may want to as it helps a lot.